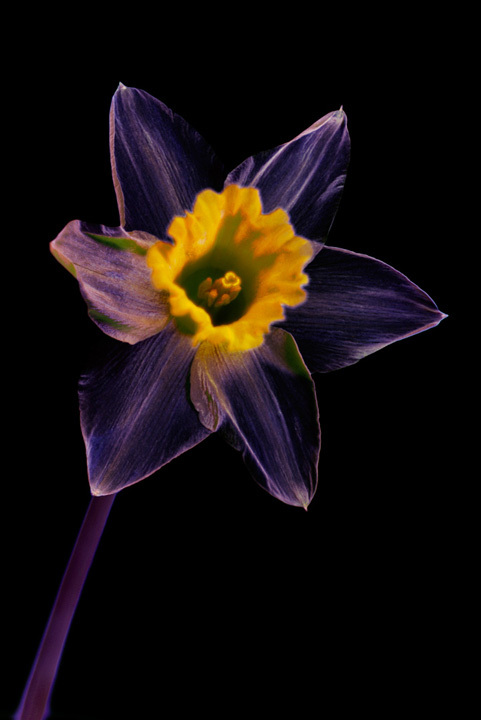 I did a bit more ultraviolet and multi-spectral photography today with a daffodil flower. 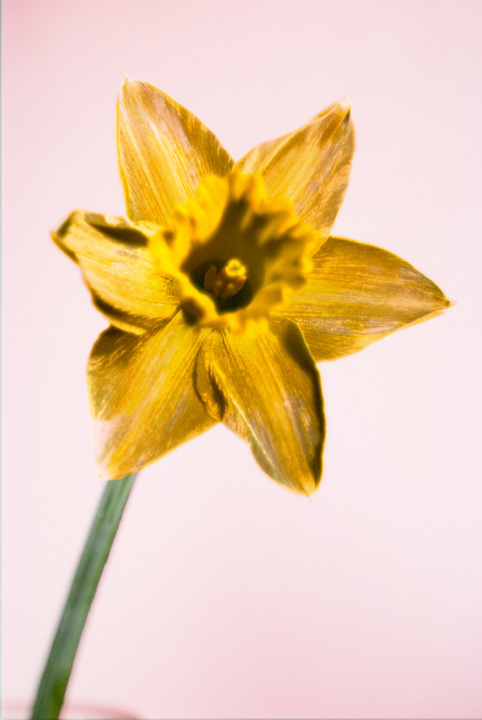 It seems that, like most flowers I've tried photographing in UV, Daffodils don't have a hidden pattern only visible in UV. For multispectral photos of the Daffodil, I experimented by putting them together in a different way to normal. The normal way would be to use the UV photo for the blue channel, the Visible light photo for the green channel, and the Infrared photo for the red channel. But instead I just added the images as layers, and then played with the blend modes of the layers and adding in adjustment layers. Above was my first attempt, which consists of a black and white version of the ultraviolet image. 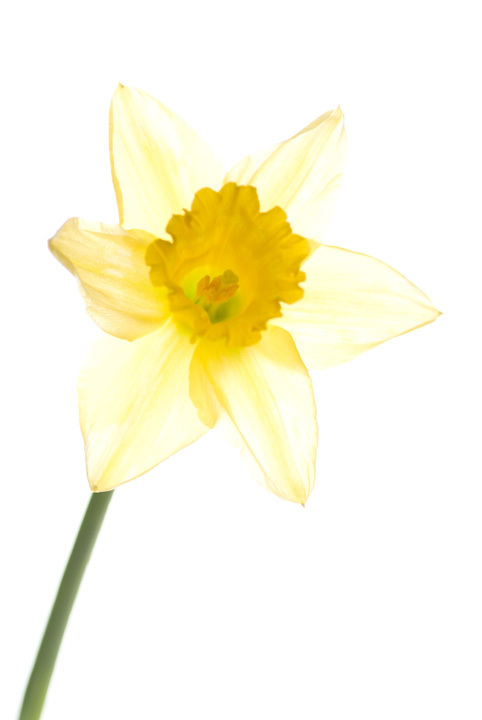 The color image is then layered above that, in the color blend mode. 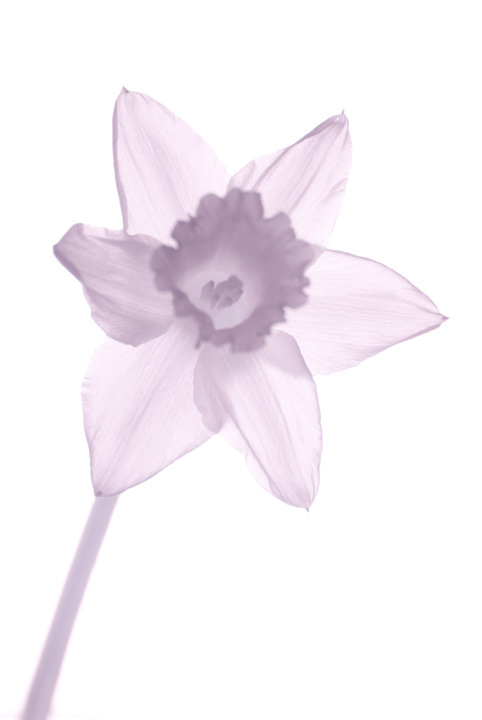 And above that is layered a red + infrared image (taken using Hoya 25A filter) in overlay blend mode. For my second attempt, I tried backlighting the visible light and infrared images. 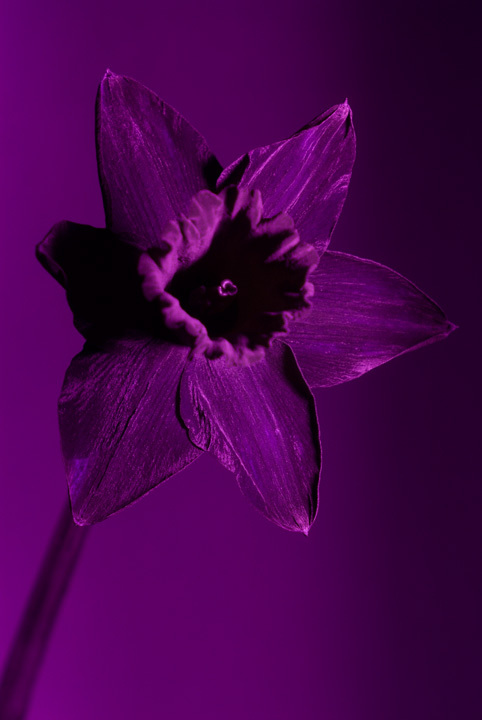 (And used a standard 720nm IR filter for the IR image). 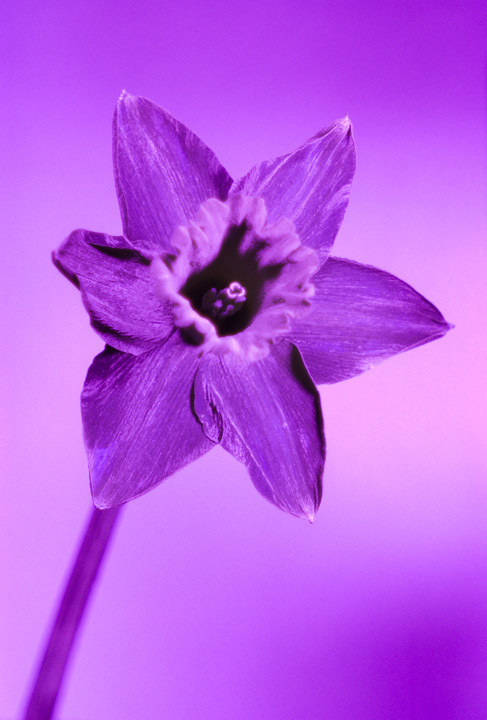 The ultraviolet image I front lit (I think it would have just been a silhouette if I'd tried backlighting it in UV). To create the final image, I first dropped the 3 images as layers into a single image. Then I aligned the images. The visible light image was used as the base layer. Above this I used the infrared image with a blend mode of Multiply. I clipped a strong curves adjustment to the infrared image to increase the contrast (black point pulled in to darken the dark tones). I then also clipped an Invert adjustment layer to it, (which gives the image its black background). 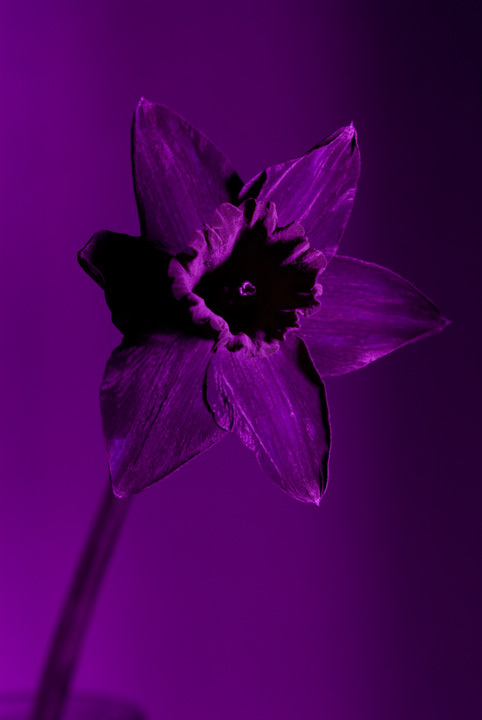 Above that, I then had the ultraviolet image, with a blend mode of soft light. And the image was finished off with a curves adjustment to increase contrast (white point pulled in to brighten the light tones). In all these images the trumpet of the flower is out of focus. It could be brought into focus by focus stacking. I would have to do a focus stack (probably only 5-10 frames I expect) for each spectrum if I wanted to try this. Maybe in the future. For the above images I used the EL-Nikkor 75mm/4 N lens. I bought this a few weeks ago, but this was the first chance I had to use it. All images were shot wide open at f/4. Unfortunately it does suffer from focus shift when shooting UV. I tested the lens against the EL-Nikkor 80mm/5.6 (not N) lens and also a Wray 3¼in. f/4.5 Supar enlarging lens to check how well it passes UV. I set the lenses at f/5.6, though the Wray might have been at f/8. The Wray lens only has f-stops marked as 1,2,3... etc. so it is difficult to know exactly what aperture it is set at. It's pretty clear that the 80mm EL-Nikkor is better at passing UV than the 75mm N lens (and the old Wray lens). The above images were only lit with one flash, I generally use two flashes or more for UV photography.